In reading, we re-read the books “The Mittens “ and “The Hat” by Jan Brett. 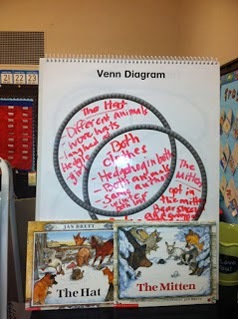 Then, we compared these books and made a Venn diagram. SK2 did a great job recalling and comparing the similarities and differences between two books. Also, Sister Madlien came to our class to read a book and students did an activity that goes along with the story. Jazaki-Allah-khairen sr. Madlien for your great work and volunteering in our class! Writing: This week, we practiced writing using words that contain long vowels. The students wrote the sentence “I like to eat peach” or “I like to eat pie.” Good job Sk2! · Read for 20 minutes with your child everyday. · Practice finding words with long vowels (ai, ay,oa, ie, ee, ea ) with your child while reading at home. · Go to starfalls.com and reading bears.org to enhance your child’s reading skills. We practiced a little more measuring with non-standard units and did lots of hands-on learning activities. On Friday, we traced out our hand and cut it out. 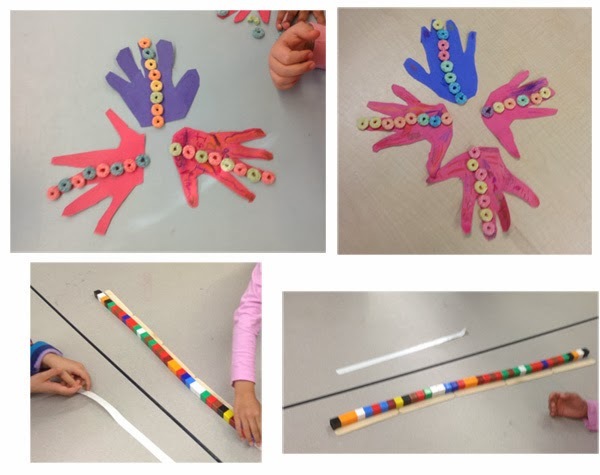 Then, we measured the length of our hand with “Froot Loops.” We counted how many Froot loops long our hand is and, finally, we ate those yummy Froot Loops. Yum! Compare the heights of family members and discuss who is shorter, taller and the tallest in the family. Play board games like Chutes & Ladders, Sorry!, Dominoes, etc. as they promote the development of counting skills, understandings of patterns, and numeral recognition. In Science, we learned how to care for birds in winter who don’t migrate and adapt to the winter weather using their feathers. We did a little experiment on how bird feathers protect the birds in the cold winter. Then, we started to make bird feeders using juice cartons, in order to feed the birds. In Visual Arts, we did a free art activity using bingo dabbers. Sk2 really enjoyed the activity and produced some creative art work, Masha-Allah! We reviewed the steps of Wudu and did a group activity by sequencing the Wudu cards in order and made a beautiful poster about it. 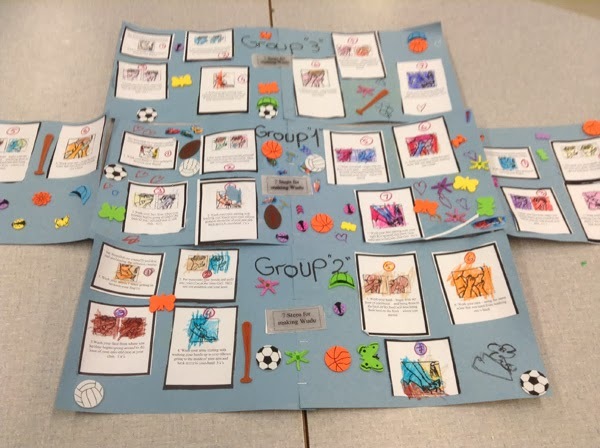 Sk2 did an excellent job interacting co-operatively within their groups and working together to complete the task. Way to go SK2! We have been playing and participating in skill building exercises such as warm-up drills, soccer and practice running. We also played co-operatively with our new giant parachute. We will be going to the Museum of Civilization on a field trip at the end of February, Insha-Allah. The details of the trip will be sent home soon.